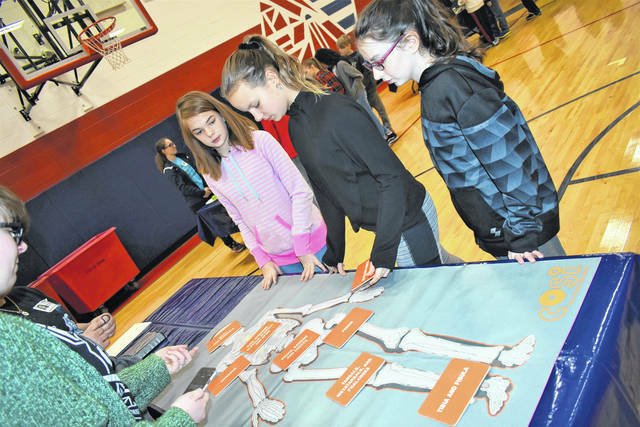 Cody Willoughby | AIM Media Midwest Sixth graders Isabelle Howard, Brenna Thompson, and Abby Blackshire assemble and label parts of a human skeleton during ‘COSI on Wheels’ on Wednesday at Piqua Central Intermediate. 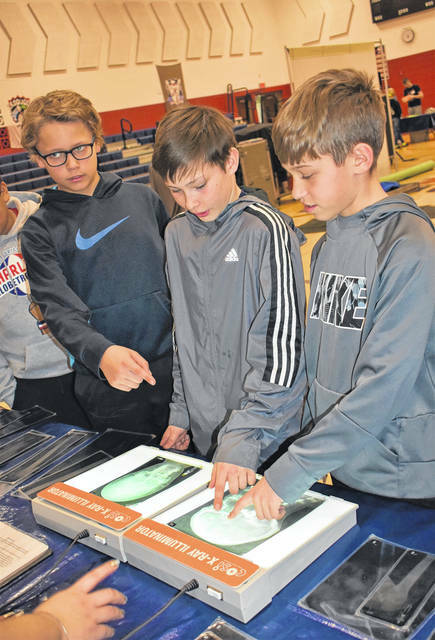 Cody Willoughby | AIM Media Midwest Sixth graders Ben Huelskamp, Christian Evans, and Joey Voskuhl indicate fractures shown on X-Rays during ‘COSI on Wheels’ on Wednesday at Piqua Central Intermediate. 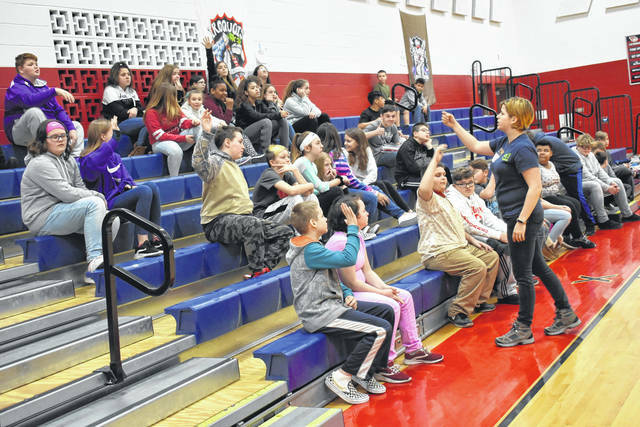 Cody Willoughby | AIM Media Midwest COSI on Wheels educator Katie Propp fields responses from fifth graders on what they learned Wednesday at Piqua Central Intermediate. Cody Willoughby | AIM Media Midwest Sixth grader Paige Croslin measures herself against the largest human wingspan on record during ‘COSI on Wheels’ on Wednesday at Piqua Central Intermediate. PIQUA — Students grades fourth through sixth were paid a visit from Center of Science and Industry (COSI) representatives on Wednesday, during the special all-day program, COSI on Wheels. This marks the second year that PCIS has hosted the program, which is sponsored through a community partnership with French Oil. “COSI gave us a list of programs, and ‘The Incredible Human Machine’ is the closest, content-wise, to our sixth-grade curriculum,” said instructor Veronica Gaier. Students were invited to the gymnasium in groups, where they were able to participate in an interactive assembly, and then pass along a series of hands-on stations. Stations covered such topics as X-ray science, microscopic observation, optical illusions, the digestive system, the human skeleton, measurement records, and even a “gross science” station, which delved into human functions like gas and waste. Approximately 15-20 student volunteers from Piqua High School’s AP Chemistry and organic chemistry classrooms were on site to coordinate each station. “I think COSI’s a great experience for us to share our knowledge and make an impact on the younger generation, but also learn from them, too,” said PHS junior Ana Adams. For more information on COSI on Wheels, visit www.cosi.org. https://www.dailycall.com/wp-content/uploads/sites/30/2019/03/web1_PCISCosionWheels4-1.jpgCody Willoughby | AIM Media Midwest Sixth graders Isabelle Howard, Brenna Thompson, and Abby Blackshire assemble and label parts of a human skeleton during ‘COSI on Wheels’ on Wednesday at Piqua Central Intermediate. https://www.dailycall.com/wp-content/uploads/sites/30/2019/03/web1_PCISCosionWheels2-1.jpgCody Willoughby | AIM Media Midwest Sixth graders Ben Huelskamp, Christian Evans, and Joey Voskuhl indicate fractures shown on X-Rays during ‘COSI on Wheels’ on Wednesday at Piqua Central Intermediate. https://www.dailycall.com/wp-content/uploads/sites/30/2019/03/web1_PCIS-COSIonWheels1-1.jpgCody Willoughby | AIM Media Midwest COSI on Wheels educator Katie Propp fields responses from fifth graders on what they learned Wednesday at Piqua Central Intermediate. 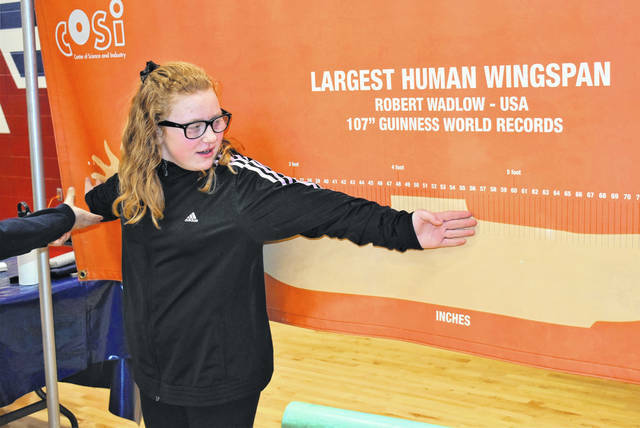 https://www.dailycall.com/wp-content/uploads/sites/30/2019/03/web1_PCIS-CosionWheels3-1.jpgCody Willoughby | AIM Media Midwest Sixth grader Paige Croslin measures herself against the largest human wingspan on record during ‘COSI on Wheels’ on Wednesday at Piqua Central Intermediate.